We offer a complete single-use kit that is ideal for exams. Best of all, it doesn't need warming to use. Why do YOUR students give up on hair removal? "Did you attend a inadequate school?" "Oh, no" was the answer. "Did your teachers fail to teach you properly?" "No, we had fantastic teachers." "Did you do hair removal in the school clinic?" "Yes we did." "It was scary being all on your own, at your new job, knowing that if you made a mistake you would hurt someone, take off skin, maybe get fired. The thing with wax/resin/soy products is once you apply it you have no time, you have to get it off immediately even if you've over applied. It became easier to leave the hair removal to someone more experienced." In other words, all these salon workers had a problem with the PRODUCT, not the PROCESS, and we decided to find a solution! Realizing that the methodology was not at fault, just inadequate products - wax/resin/soy, we worked to develop the Sugar 'n Strip System® - products that are easy to teach, easy to use, never stick to skin just hair, and clean up with plain tap water. “One day, while watching a class of our students learning to wax eyebrows, one of the students spilled a large dollop in the middle of another student’s eyebrow. Chaos reigned while people looked for the solvent to remove the wax. Extreme care was needed to leave as many hairs as possible so as not to ruin the girl’s appearance. Even using their very best efforts they were only partially successful. Coincidentally, Salon Sugar® products was scheduled that day to demonstrate their Sugar ‘n Strip® system. The educator, Kate Riley, showed everyone how the student has complete control over the Sugar ‘n Strip® paste. The students were amazed that not only did it remove very short hairs, but it didn’t remove any skin layers. Equally impressive, the students could take as long as they wanted to shape the eyebrow perfectly. Finally, mistakes or clean-up of any extra sugar was easily done with plain tap water. "After switching to the Sugar ‘n Strip® system, it was a pleasure to teach my novice stylist students eyebrow hair removal. I could demonstrate to them, have them apply Sugar ‘n Strip® to both their models’ eyebrows at the same time, then stop them to wait for me to check their applications before they removed any hair. By working in this calm, controlled manner, they gained confidence and expertise in record time. Anyone who had applied too much sugar or made the brows too thin had only to wash it off with tap water, take a breath and start again. All the students were successful the first day. They enjoyed the realization that with such a gentle product they could compliment their client's hair style, not send them away with red, angry skin. It was easy after that experience to move them into full body hair removal." Linda P.
These great results inspired us to produce a complete Program specifically designed for schools; utilizing the Sugar 'n Strip System®. Our 3 exclusive paste strengths can be used in almost the same way as wax/resin/soy, and have been formulated for use on the three hair types: Vellous, Intermediate and Terminal. Another feature of our exclusive program is the availability of Power Point, Lesson Plans, Treatment Guides, certificates, USB drives and online accessible professionally produced videos (no silly uTube) for the students and the teachers. Our Treatment Guides/Exams/Certificates are available in English, Spanish and French. We are also happy to arrange onsite education at a reasonable cost if you require it. This allows the school to pass on their new Sugar 'n Strip® expertise to the students - confident in the knowledge that the products and techniques are fully compliant with State Board requirements. You will be able to teach your students the simple unique techniques in only a few hours. Our safety and hygiene standards combined with the extremely low chance of liability meet the highest State/Provincial Board/OSHA requirements, and our easy to understand method makes this a natural fit for school curricula. Let's face it, who likes "sticking" to the wax room floor, cleaning the nasty mess, wasted, ruined towels and treatment tables? This product cleans up completely with PLAIN TAP WATER! What a pleasure to work with. The product is simply warmed, applied with a spatula in an ultra-thin layer, and removed with a cotton strip. Eliminates student stress. no need to rush since the product remains usable on the skin for as long as needed. Liability is eliminated. The product sticks only to the hair so is gentle on the skin. Mistakes and spills are cleaned up with plain tap water leaving no mess or stains. This all-natural product is entirely food grade – it can be eaten! 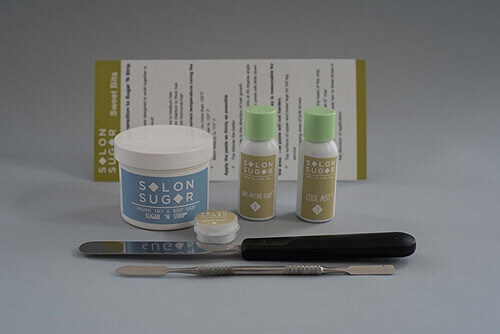 WHY ARE SALON SUGAR® PRODUCTS THE BEST FIT FOR YOUR SCHOOL? For 20 years we’ve been manufacturing sugar pastes for professional use in the USA/Canada. Our Sugar ‘n Strip® system can be taught by you to your students in a hands-on four hour session. 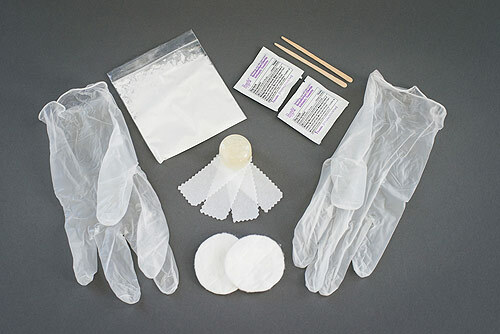 We have a NIC Compliant Test Kit available (see photo) for the hair removal portion of their Board Certification. Our products have consistent quality, scientific process, and no artificial dyes-additives-fragrances or preservatives. Contact us now and find out how easy and inexpensive it is to bring this revolutionary product to your school so that your students can enjoy a sugar of a day! Learn more about our Sugar 'n Strip® system and how it can best work for your students.